YouTube no longer supports the software component used for Website Builder v6 and InstantPage. 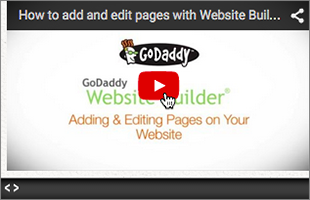 However, you can still display YouTube videos by adding HTML code to your Website Builder v6 pages. If necessary, from the Pages menu, select the page to which you want to add a video. Click the content block you want to edit, and at the block's bottom-left, click the HTML button. After the Edit HTML window opens, switch to a new tab or window in your web browser. 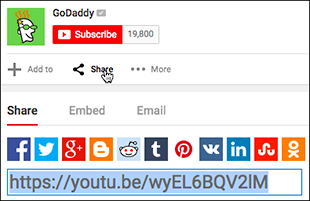 Browse to the YouTube video you want to place on your page. Click the Share button below the video to display a field containing code. Click Embed and then Show More below the code field. 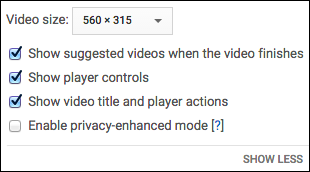 Use the Video size menu to choose a standard display size or Custom size, then select or deselect the choices listed below the menu. Note: The code field's content changes based on your choices. Copy all content in the code field. Switch back to your Website Builder v6 page and replace the Edit HTML window's code by pasting in the copied YouTube code. Click OK to close the Edit HTML window. Note: To preview the video within your Website Builder v6 page, click the play arrow. To adjust the settings, click the < > button again. Learn how a similar process lets you Add Google Analytics. How to embed YouTube video to my blog? How to insert mp4 video without using Youtube/social media? How to delete a category on the add products page? There is an add button but no way to delete.